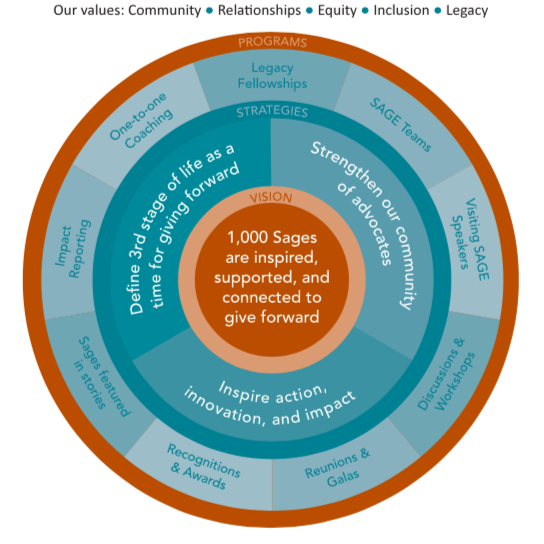 SAGE was founded in 2011 as an Oregon nonprofit corporation. We are a charitable organization with 501(c)(3) tax-exempt status, and funded through tax-deductible contributions. SAGE is led by volunteer board members and staff. Our office is in Portland, Oregon at 1515 SW Fifth Avenue, Suite 600. To learn more about our work, review our Annual Reports, Financial Filings and Non-discrimination Policy. SAGE has a Strategic Plan to guide our work between 2018 and 2021. Click here for a simple illustration of the main components of our Strategic Plan.